Suites & Staterooms - ROGER KERSHAW CUSTOM TRAVEL INC.
All SeaDream suites & staterooms are ocean view. There are 54 Yacht Club Staterooms measuring 195 square feet. 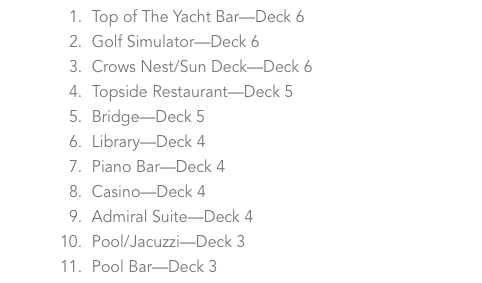 16 of the Yacht Club Staterooms can be converted to 8 Commodore Suites (double Yacht Club). 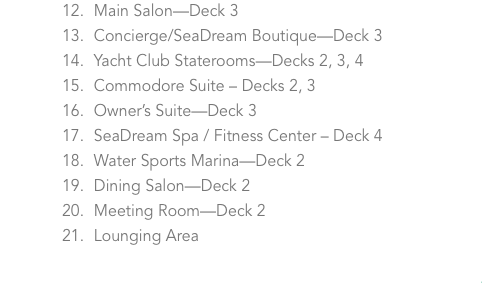 There is also one Admiral Suite and one Owner's Suite (sold out). Based on how the staterooms are configured, yachts can accommodate from 94 to 112 guests (based on double occupancy). With a crew of 95 to pamper you! ​Enjoy 375 sq. ft. / 34.8 sq. meters of living space with ocean views from a total of 3 picture windows. Partitioned living and dining areas with ½ guest bath and closet. Nespresso coffee maker. 2 – flat screen TVs & DVD/CD player. Separate and private en-suite master bedroom with permanent queen bed and closet. Marble-lined bathroom with multi-jet shower and soaking tub. Built-in dresser with writing desk. The Admiral Suite is Suite 400 and is near the Library. ​Combine two Yacht Club Staterooms to create a Commodore Suite. These comfortably appointed ocean viewǂ suites provide a choice of two twin beds or a queen size bed, two full marble-lined bathrooms with multi-jet showers, a seating area with sofa, coordinated chair and cocktail table, 2 spacious closets and built in dressers with writing desk. Configuration allows for either an additional permanent queen bed or dining area. 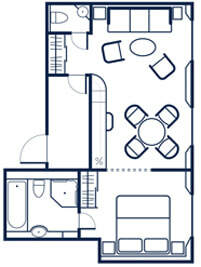 There are eight possible Commodore Suites and they average 390 spacious sq. ft. / 36.23 sq. meters. Yacht Club Staterooms average 195 sq.ft./18.12 sq. meters. These picture window ocean view staterooms include a marble-lined bathroom in select staterooms with multi-jet shower and a well-appointed open living area with sofa, chair, cocktail table, and built-in dresser with writing desk. Choice of 2 twin beds or 1 queen bed. Deck 4 staterooms enjoy close proximity to the SeaDream Spa, Fitness Center, and Library. Deck 3 staterooms are the perfect location for guests who desire to be just feet from the pool (aft, deck 3).